I believe that Olaf is a typical Scandivanian name and maybe Keira wrote the book before Frozen came out but it’s true. Can you imagine this happy snowman as a river troll? :D.
Overall, Zaria Fierce and the Secret of Gloomwood Forest was a great book with a lovely story and amazing characters. 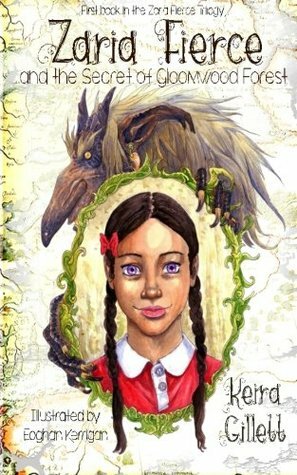 It’s a fantasy and adventure book that will be the delights of Narnia fans and those looking for a bit of Norwegian folklore thrown into it. Keira Gillett, and consequently illustrator Eoghan Kerrigan, created an adorable book that I will give to my niece to read in the future. Hello and good morning to everyone! Thanks Ner for letting me take over your blog. I’m so glad I’m joining you today. My name is Keira Gillett and I just wrote and published my first book, Zaria Fierce and the Secret of Gloomwood Forest, the first book in a new Middle Grade/YA trilogy. It released earlier in March 2015. Because the setting of my book takes place in Norway and involves many Norwegian and Scandinavian words and names, so I thought I would provide a pronunciation guide. Here is how some of the names of characters and places are pronounced. Disclaimer: The breakdown on syllables is not standardized or proper. Instead, I attempted to provide a phonetic breakdown. You will see short words (which are to be read with an American pronunciation) and conversational gap sounds. Vowels left alone should be pronounced like the letter and not as a sound. A few entries also have variations of the pronunciation. This is a variant of Christopher, Chris·toe·fur. He doesn’t like warm hugs. Or you can think of it like Alex, but you will want to add a bit of an extra “s” sound at the end. This name can also be pronounced like Guy·ear, Gey·er, Gay·ear, or if you must, Gear. This name is very close to Phillip, which is usually said as Fill·lip. This name is a variant of Edward. It’s like Nickel but with an M and the French river that runs through Paris. Not to be confused with Vulcan, but similar enough. One of the fun things about producing an audio book was getting to hear someone else say how I heard these names in my head. Michele and I would send links back and forth to various sites where these words and names were pronounced just to make sure we were on the same page. She does an absolutely marvelous job narrating.